Is cricket losing its appeal? I never believed people when they say soccer would push cricket on the back burner. When you look at the crowd that supports soccer games in Belmopan, Belize it’s fascinating. But cricket still has its diehard fans. The people who love cricket are passionate about it and will follow the teams all over the Belize Rural North District to support and promote their teams. The Belize District Cricket Association is the governing body for Cricket in the Belize District, the former President was Mr. Gilroy Middleton; He is now a City Councilor for Belize City. 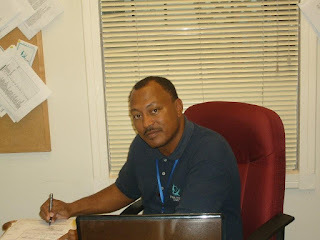 Elections were called in late March 2008, a new executive body was elected and Mr. Elihue Bonner was voted in as the new president for the association for 2008 /2010. The executive body consists of seven (7) Members. The regular competition is the Harrison Parks Competition which usually starts mid-February or first Saturday in March. The duration of this Competition is three to four months and would consist of Teams from the Belize Rural North. There are thirteen teams registered for 2008/2009 season, the highest number in the last ten years. The 2008 competition was delayed due to heavy rains and the death of two icons, Mr. Sailos of St. Pauls Bank and Vallan Hendy of Flowers Bank who was one of the most senior Cricket Umpire in the Belize District Association. The scheduled games were played throughout the year up until the semi- finals; a decision was made to finish the 2008, competition in early January 2009 because of severe floodings in the Belize River Valley. Teams that reach the semi-finals were Surprise of (Lemonal), Brilliant of (Crooked Tree), Excellence of (Double Head) and Wicked Eleven of (Flowers Bank). These games were played on the home field of some of the teams with the best of three and are govern by eleven BY-Laws, for the semi-finals and finals. The registered teams were split in two zones; Zone one and Zone two, and in the semi finals; Zone one first place Verses Zone two second place, and Zone two first place verses Zone one second place, four teams participated in the semi-finals. The competition is now in its final leg with Brilliant of Crooked Tree from Zone One, verses Excellence of Double Head Cabbage for the Championship and Sub-Championship games. There will be lots to look forward to in what promises to be a fascinating best of three series, scheduled for Saturday, January 31, 2009 at Lords Bank Cricket Field and February 7 & 14, 2009. This will be another chance for Brilliant to take the Championship Trophy home to Crooked Tree Village the third year in a row.